“Evolution is promoted by its practitioners as more than mere science. Evolution is promulgated as an ideology, a secular religion—a full-fledged alternative to Christianity, with meaning and morality. … Evolution is a religion. This was true of evolution in the beginning, and it is true of evolution still today. … [it] came into being as a kind of secular ideology, an explicit substitute for Christianity.” Would you believe this is a quote in National Post, May 13, 2000 by leading anti-creationist philosopher (and self-proclaimed “ardent evolutionist”) Michael Ruse. This should be no surprise, given that the stakes are so high. The evolution-creation debate deals with some of life’s most important issues—such as, were we created and thus have purpose, or are we and all other living things a spontaneous effervescence of nature, destined for nothing nobler than organic manure? This tour de force by Dr Bergman plunges head-first into this emotion-charged arena. 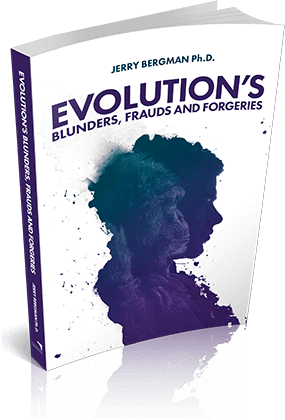 It confirms Ruse’s point ‘in spades’ by dealing with an amazing array of not just frauds and forgeries, but blunders and embarrassments of all types by evolution’s practitioners and promoters. And—importantly—it reveals the way in which they were so readily accepted and believed by some of the biggest names in academia. Many of these examples will be unknown to most; a good number of facts were completely new to me, despite decades of familiarity with the literature in the debate. The book will be a very significant eye-opener for all who read it. It relentlessly exposes things that most evolutionists would probably rather not discuss, or hope stay forgotten. Readers are free to draw their own conclusions as to what could possibly drive and motivate such a sorry parade, but it becomes blatantly obvious that ‘science’ is no longer a good answer. Taken from Foreword by Dr Carl Wieland former CEO of CMI.